Although it lacks some advanced features, the Garmin Vivofit 4 activity tracker comes for less than 80 bucks and promises to deliver more than a year of autonomy on two SR43 replaceable batteries. An activity tracker should be in place to do its job, not in its charging cradle. Based on this idea, Garmin has created the Vivofit 4. Although it does not have the design and features of its more expensive competitors, it focuses exactly on the parts that really matter for this category of products: affordability and autonomy. The Garmin Vivofit 4 is both swim- and shower-safe, featuring a sleek, comfortable band. This activity tracker has a sunlight-readable always-on color display to provide the user with information, but can also be paired with a smartphone for additional features thanks to the Garmin Connect app (available for free on Android and iOS). The list of activities that can be tracked by the Garmin Vivofit 4 includes walking, running, biking, swimming, and using an elliptical. The list of additional features includes a weather widget, Find My Phone, as well as basic alarm watch capabilities such as multiple alarms, countdown timer, and stopwatch. According to Garmin, the Vivofit 4 can provide "an incredible 1+ year battery life" without the need to recharge. In fact, this wearable uses two SR43 batteries that can be easily replaced by the user and can be acquired for as low as US$0.5 a piece (they usually come in packs of 10 or more). 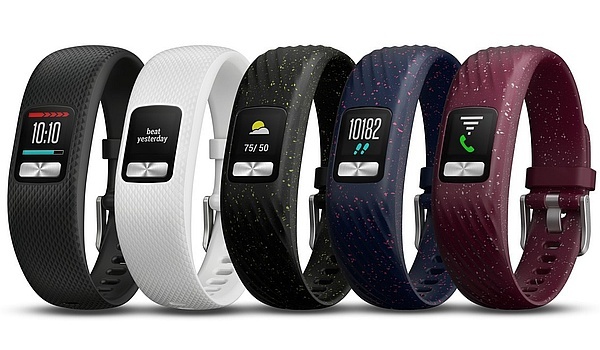 The Garmin Vivofit 4 comes in white, black, and lime green speckled. It can be acquired via Amazon for US$79.99. The bands are interchangeable, and a speckled merlot and speckled navy combo pack is already available for purchase for US$29.99. Individual bands can also be acquired and have a suggested retail price of US$19.99.